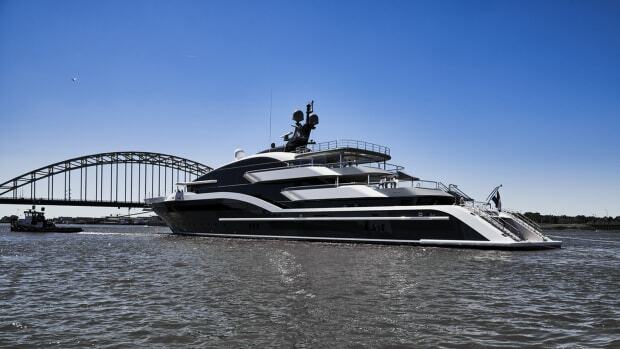 The owners of the Nordlund 106 M/Y Venture More now have a yacht that will let them do just that. Several years ago, the owners of a 95-foot Nordlund/McQueen motoryacht pondered the condition of their boat. Although they enjoyed her, she needed a costly refit. 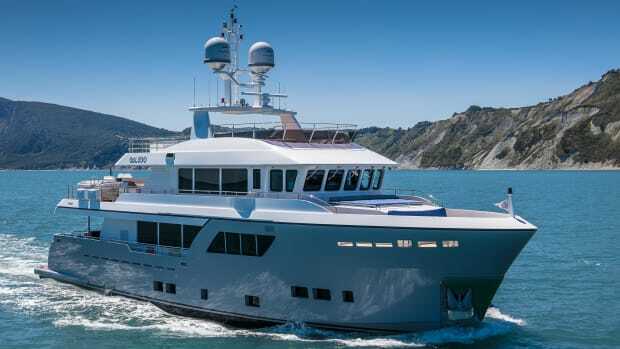 And as the father and son team contemplated their needs—more space and greater capability for extended fishing expeditions between the U.S. West Coast and South Pacific—commissioning a new yacht revealed itself as the clear path forward. More than four years later, the 106-foot Nordlund Venture More was delivered. 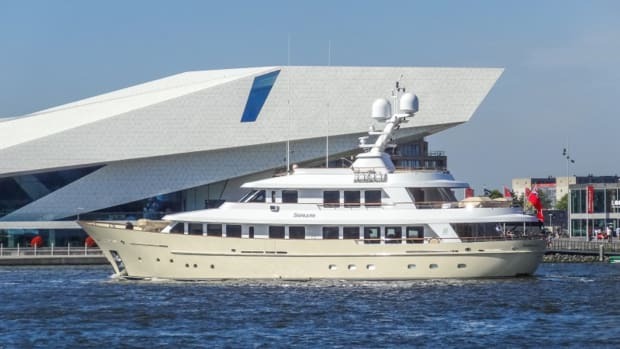 She’s a stylish, carefully planned and beautifully executed offshore passagemaker that could well be considered the new benchmark for a West Coast-style yachtfisherman. 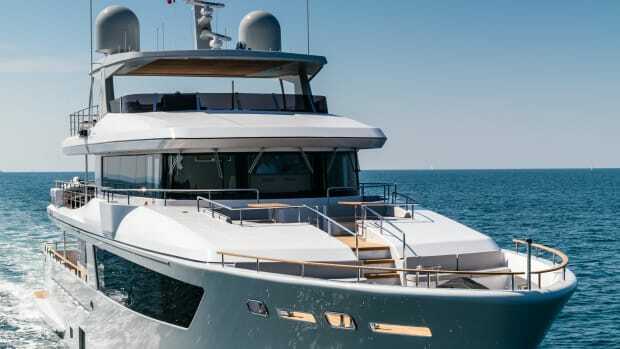 The builder’s 110th boat, Venture More represents the latest in a line of yachtfishermen that Nordlund has constructed throughout its more than 55-year history. This type of boat is markedly different from the yachtfishermen that were common for so many years along the East Coast of the United States. Eastern-style yachtfishermen, built by such highly respected yards as Rybovich, Burger and Huckins, have fallen from favor during the past 20 years or so. 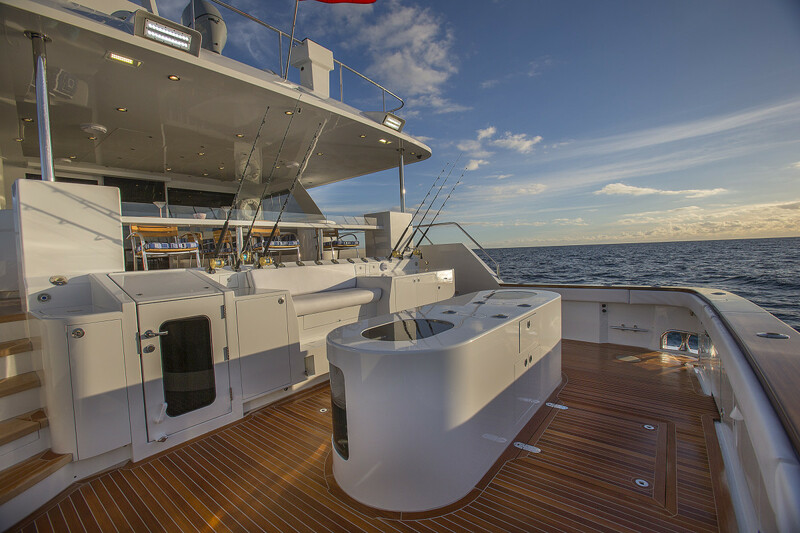 Essentially flush-deck cruisers with a cockpit used for fishing and diving, the style has been almost entirely replaced by larger and larger convertible sportfishermen from such production builders as Viking and custom shipyards including Merritt Boatworks and American Custom Yachts. Their Western counterparts are a different kettle of fish, so to speak, and have continued to maintain popularity among adventurous cruising anglers. 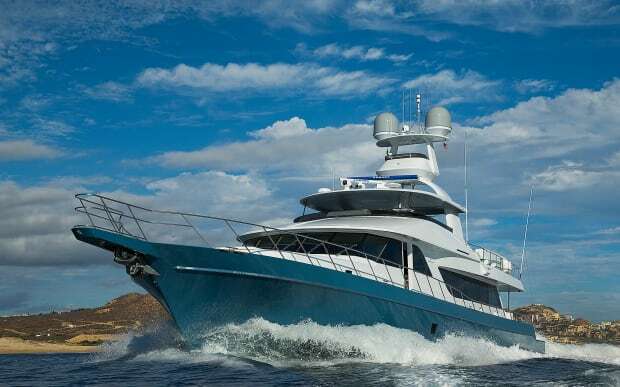 Designed for the widely variable weather and sea conditions in the Pacific between Alaska and Central America and points west, these motoryachts are of the raised-bridge variety with a covered main deck aft (or “California deck,” as they call it on the West Coast) abaft the salon, overlooking a cockpit. 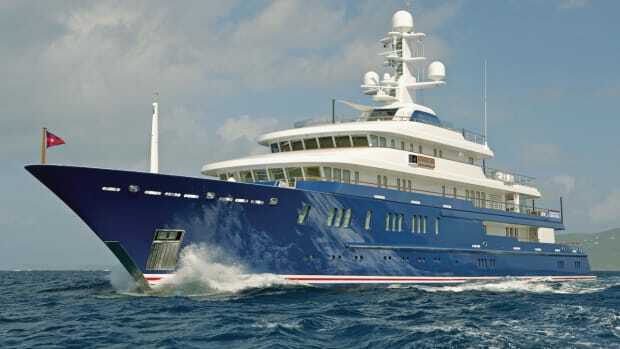 To provide timeless designs that are as handsome as they are seakindly and efficient, Nordlund has long employed a pair of Washington state-based professionals: naval architect R. Edwin Monk, who is responsible for styling, arrangement and hull lines, and Tim Nolan, a naval architect who handles structure, most systems and mechanical details. Tacoma, Washington, native Mary Flores developed the interior details for Venture More. 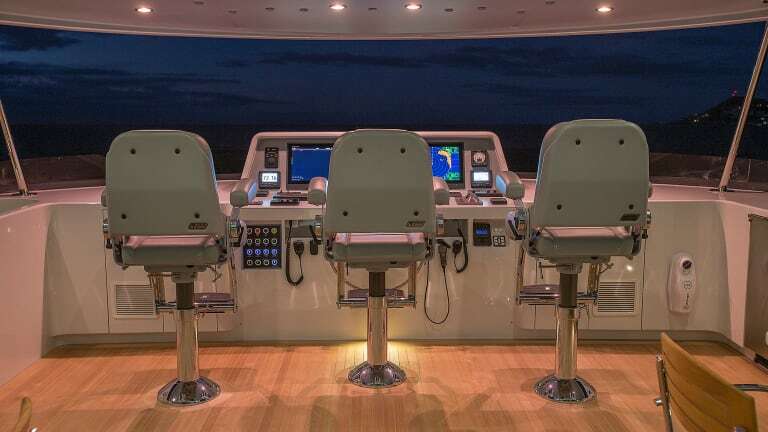 During the past nine years, Flores has designed interiors for four of the company’s boats, working closely with Westhoff Interiors, an architectural woodworking firm in St. Paul, Kansas, that produces 3-D renderings, joiner details, shop drawings, samples and finished joinery for the shipyard. Flores says she began talking to Campbell when he contacted her about the possibility of doing a refit of the family’s 95-footer. 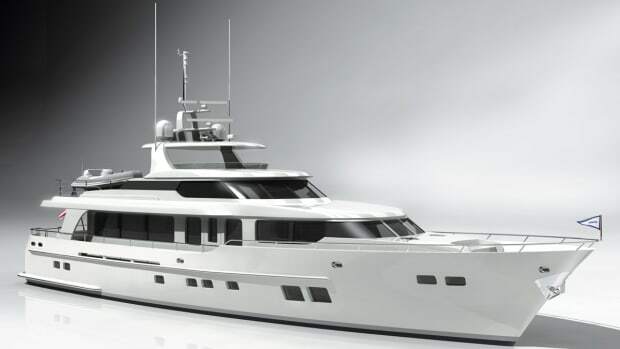 After reviewing the color boards that Flores produced for the refit, the owners commissioned her for the new project. “They wanted a clean, simple, contemporary design with lots of natural light,” says Flores, adding that with the new build, the owners embraced the light and airy feel of the 95-footer’s white oak joinery. 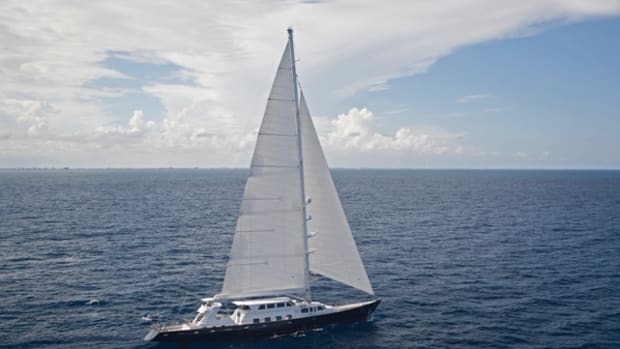 The yacht’s arrangement is similar in many respects to previous Nordlund yachtfishermen, with a main-deck galley adjacent to an open-plan salon with areas for lounging and dining. A stairway leads below to a lobby and a full-beam master suite that is abaft a pair of guest staterooms. Farther forward, a stairway from the wheelhouse leads to cabins for the captain, crew and extra guests or family members. The décor includes a palette of soft colors in a variety of materials, including tile, glass, stone and textiles. One area illustrates the planning that went into maximizing stowage and accessibility to equipment and systems. 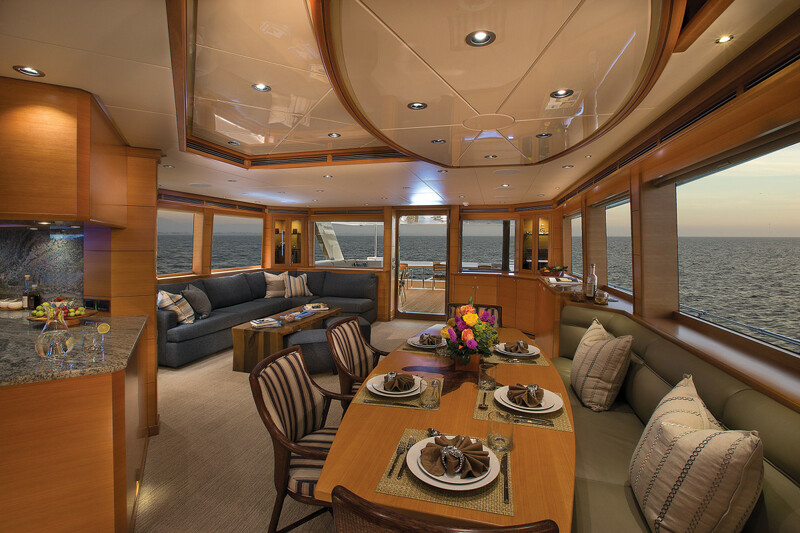 The finished space with full headroom, accessed by a dedicated stairway from the crew quarters, is a feature rarely seen aboard a yacht of this size. The center of three compartments houses laundry machines, a slide-out table, a foldout ironing board and lockers. Another space is forward for the bow thruster, and a space is abaft the laundry for retractable sonar and equipment, with additional stowage. Campbell says that during the design phase, with everything desired for extended periods at sea, the outfitting list began to conflict with the naval architect’s weight study. Many structural components—all exterior doors, hatches and frames, as well as the arch, bucket and surrey top of the crow’s nest—were built of composite to reduce weight along with long-term maintenance. 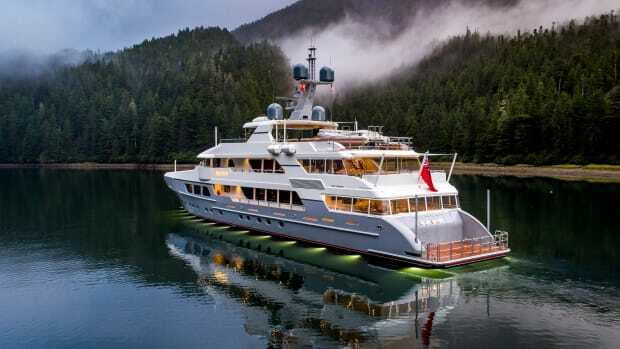 Having spent her maiden voyage in Mexico and Central America, Venture More has returned to the Pacific Northwest to cruise in Alaska before resuming the owners’ quest to experience new and distant ports of call. 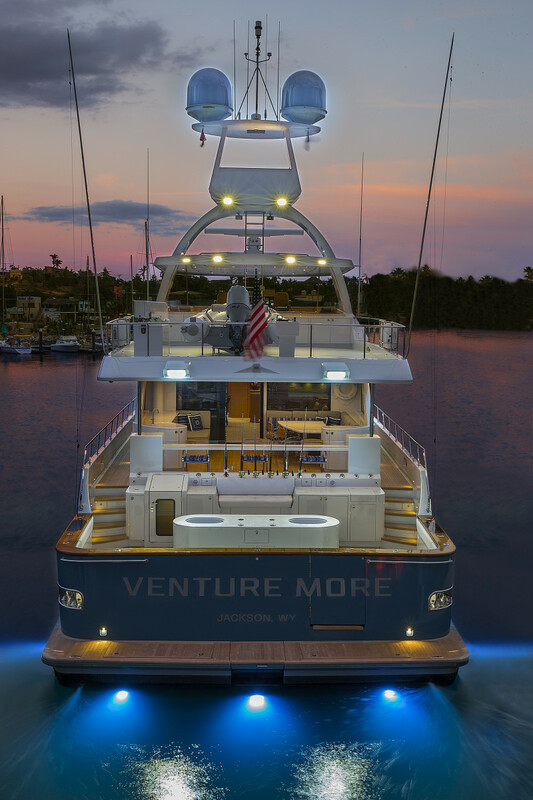 Yet, beyond what her name suggests, Venture More has an additional meaning, one that is indicative of the owners’ decision to press ahead with a new build instead of refitting their existing yacht. 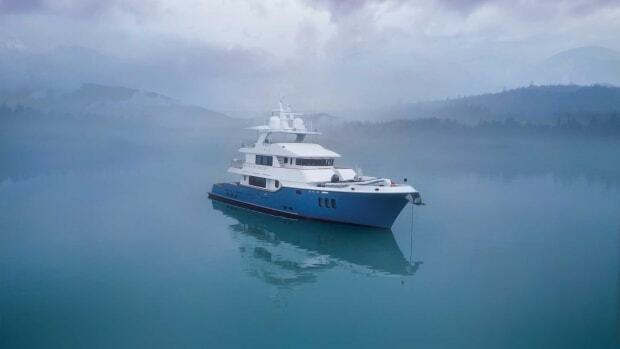 In taking the leap, they were rewarded with not only a larger, more substantial boat, but also a noteworthy yacht that sets a new, higher standard for American-made yacht fishermen.